The “Prathyabhijna Retreat” is an invitation to all those who have the calling to take their existing meditation practice to a deeper level. It is an invitation for those with a profound aspiration to deepen their spiritual understanding and to stabilize in the consciousness of oneness. The classic 49-day period begins with participation in a 10-Day Hridaya Silent Meditation Retreat led by Sahajananda, followed by 39 days devoted to intensive meditation practice in an individualized setting. During the weeks of solitary meditation, Sahajananda will continue to provide personal supervision, guiding each practitioner through the retreat via written communication. This Individual Silent Meditation Retreat will suit seasoned Hridaya practitioners and adepts of other practices alike, and requires strong determination and an attitude of surrender to the Spiritual Heart, the Divine Consciousness. The 49-Day Meditation Retreat starts with attendance at a 10-Day Hridaya Silent Meditation Retreat in order to be initiated into and to recall the main elements of Hridaya Meditation. After this initial period of intense guidance, the practitioner moves into a solitary setting, supported by Sahajananda with personalized practical advice. Hridaya Meditation is the main, essential practice of the Pratyabhijna Retreat and is supplemented by other important techniques recommended in the Shaivist Tradition, Mahamudra, and Dzogchen. The purpose of all of these practices is to create the best conditions in order to recognize the Universal, unique nature of Consciousness. Personal guidance from Sahajananda helps participants deal with obstacles that arise during meditation and to break through subconscious limitations and self-created boundaries, therefore taking their meditations and spiritual understanding to a deeper level and ultimately recognizing the consciousness of oneness. During the period of solitary retreat, the suggested daily schedule includes a minimum of 8 hours of Hridaya Meditation, 1-2 hours of relaxed Hatha Yoga, and 1 hour of Pranayama. 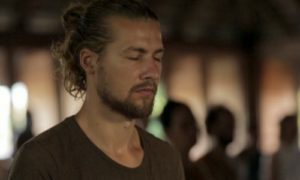 The retreat will begin in Mazunte at the Hridaya Yoga Center, as participants take part in a group 10-Day Hridaya Silent Meditation Retreat. Participants will then move to Hotel Ambarina, a beautiful, isolated hotel in Agua Blanca, a forty-minute drive from Mazunte in the direction of Puerto Escondido. Participants will each be provided with their own rooms and private bathrooms, with meals delivered twice per day. All rooms are spacious and new, each with a large private balcony overlooking the beach and ocean. The beach is very quiet and remote with few visitors, so the feeling of seclusion is greatly enhanced at this location. The price for the 49-Day Retreat includes a course fee as well as accommodation and food for 39 days at the hotel. It does not include food or accommodation during the first 10 days of the retreat, but these are both available at the Hridaya Yoga Center. Prices are subject to change but are approximately $1,305 USD (regular price) and $1,163 (low-income discount). Please contact 49days@hridaya-yoga.com for current pricing information. For more detailed information, please read the 49-Day Prathyabhijna Retreat FAQ. To see the date of this year’s retreat, visit our Calendar. If you are interested in joining us on this amazing spiritual adventure, apply here. Note that completion of at least one 10-Day Hridaya Silent Meditation Retreat is a pre-requisite for this course. Please be aware that we strongly recommend scheduling a minimum of one additional week preceding and following the retreat to allow for settling in and re-integration. “The 49-day retreat was an absolutely indispensable, fundamental experience for an adept of meditation who wished to go deeper into the revelation of the Self. The retreat was pure grace. After taking more than 20 10-day retreats, I felt that it was my first real retreat, as though I had tasted an appetizer 20 times and finally received the main course. To meditate alone in room was a completely different experience than being in a yoga hall with others. It gave me the opportunity to meditate long, uninterrupted hours without the subconscious worry of time restraints. I loved meditating throughout the night when all was quiet, creating the schedule that best suited my personal rhythm. The sheer amount of time spent alone allowed a much more profound purification of the depths of my being. Every memory, life experience, contraction or pain seemed to surface, there was no hiding or pushing it away when left alone for that amount of time. The meditations themselves were, of course, deeper than I ever experienced before. Without stimulation from the external world or any intellectual input, the right brain was allowed to dominate over the left brain, and the transcendence of the mind was more complete. I experienced deeper stillness and expansion than I could have ever imagined. In terms of worldly applicability, I feel that something shifted permanently in this being, a more stable, higher perspective on reality. There were various insights that helped this personality in terms of patience and compassion for the world. I feel healed in many aspects, including psychologically and physically. The heart feels more open, with a naturally applicable desire to give love in the form of service to the world. Interested in Long Solitary Retreats? In addition to the 49-Day Prathyabhijna Retreat, we also offer ongoing Dark Room Retreats. Check out an inspiring and informative article about an experience of 40 days in total darkness here.